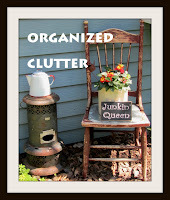 I started blogging in early December, 2011. I really and truly thought that I was ready. (But I look back now and shudder). The photo quality, the photo quantity (sometimes one photo per post), and sometimes even the idea needed a little tweaking. Here is my mantel with oil lamps and teacups and a pine swag. This is the old yellow wall living room, with the floating book shelves and teacups. I painted the walls white in 2012, and went with a little more casual vintage decor. 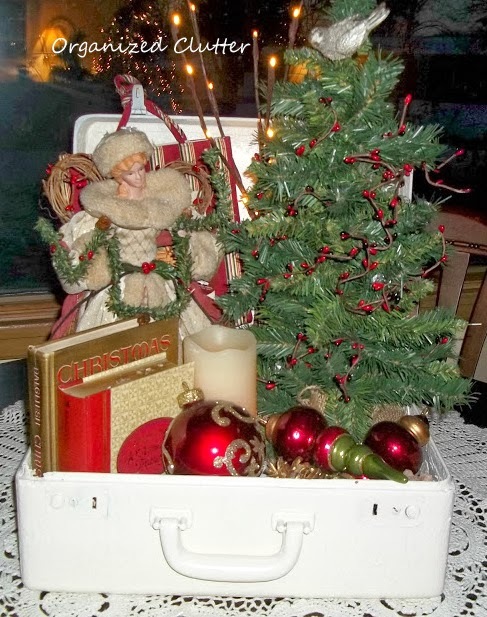 The first appearance of my vintage suitcase Christmas vignette. My kitchen shadow box was red in 2011. It was painted black in 2012. The chairs were gone in 2013. My 2011 Christmas shadow box was filled with vintage cookie cutters, snow villages, salt and pepper shakers, and a nut grinder. Another shadow box in the kitchen had wood stars and a stainless tray and metal Christmas trees. Also in my kitchen, a Christmas bird vignette. And outside, a Snowflakes' vignette on my picket fence shelf. I think I have gotten better at photography and creativity since then! I hope you have enjoyed my growing pains! I love your photos! The oil lamps are beautiful! I'd say you hit the ground running girl! My old photos are much more frightening!! Your photos are lovely. Beautiful beginning! Good Morning Carlene, I have to tell you, I think probably we all cringe a little at our early photographs.... I know I do, but at the time I thought they were fabulous..... but I have to tell you, you have nothing to worry about, as your photographs do look lovely.